LENGTH: 14 km Circular Route. DURATION: 6 hr. 30 min. ACCESSIBILITY. We ascend on the road: Camí de la Colònia and when we reach the fork, we turn right until the end of the road: Camí de la Colònia (Racó del Bou). 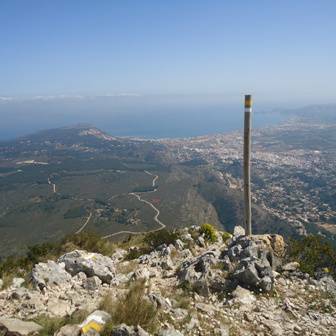 Here, there is a path on the left which has a mild steady ascent up to the Montgó plains area. In the final section of the ascent, the path becomes a little steeper and the slope increases. 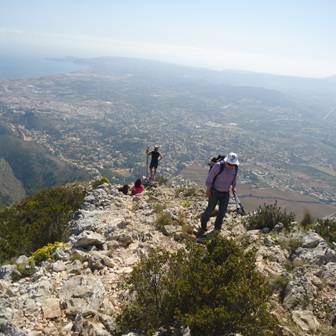 When we reach the Montgó plain, instead of taking the bypass to the left towards the Creueta de Dénia, we continue straight along the path. After hiking 1,200 m along the plain, on our left, we can see a zone marked with stones which indicate the bypass to the Cross: Creueta de Dénia. We hike 500 m from the bypass until the path passes between a solitary pine tree and a natural rock cover. This point can be used as refuge in the case of adverse weather conditions. The descent in the East direction has an initially steep section with a major slope between large rocks which will oblige us to advance by using our hands for greater safety. We continue our descent in a steady zigzag pattern along the path. This descent section has been signalled as PR CV.355. A short time before completing this zigzag descent, we take the fork on the left in the direction of the cave: Cova del Gamell, and from there, we link up with the road: Camí de la Colònia until we arrive once more at the starting point. PRECAUTION. This is the longest and most difficult of all the described routes due to its distance and level difference in addition to the steepness of the trail in several sections. It is solely recommended for persons who are accustomed to hiking on mountain trails and capable of assuming this challenge. Hikers must strictly observe the recommendations to prevent risks in the mountains.